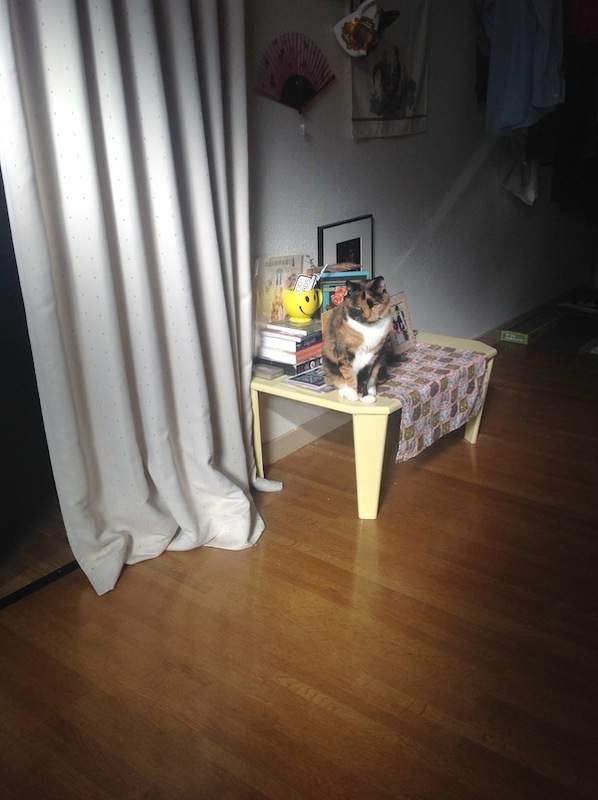 Since moving to Japan a few months ago, I’ve learned more than a few things about my new home that have deepened my dedication to my cat, Brandy. She thrives on the fancy canned cat food ZiwiPeak, which she ate in Hawai’i, so I order her food by mail. She is kept happy and healthy through the help of some meds and supplements, so we rigorously monitor them with the help of our fantastic Japanese vet. And my daily life is split between working from home to earn the bucks to keep her purring and diligently cleaning her litter box in our teeny-tiny Japan apartment. Life has changed significantly for us, and no small part of it is focused on the fact that I moved my cat thousands of miles from everything she knew in the U.S., so I’d better keep the kitty pleased! I work harder than ever to maintain my cat’s quality of life, but surprisingly I’ve found that if I’m going to cherish my cat and treat her with the respect she deserves (she’s watching me type this right now), Japan is the place to do it. 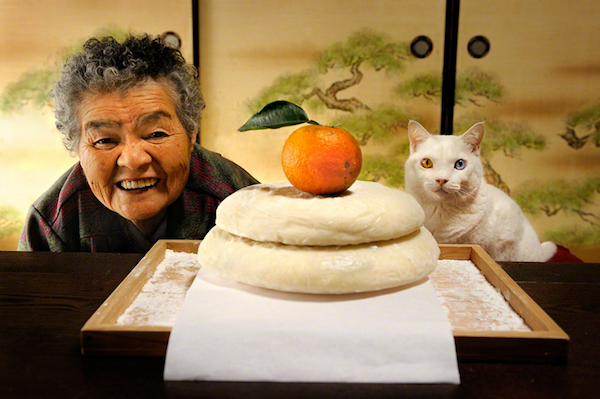 Sure, most people have heard of Japan’s obsession with cats, specifically the cat cafes. Cats are cute and Japan is a culture of cute. But what some don’t realize is that having a cat is something of a privilege that many people can’t have in their lives, due to cost or building restrictions. Therefore, those lucky enough to have a “neko” (cat), or any pet, treat their furry family members with the utmost care and respect. This extends to their death and after-death care. 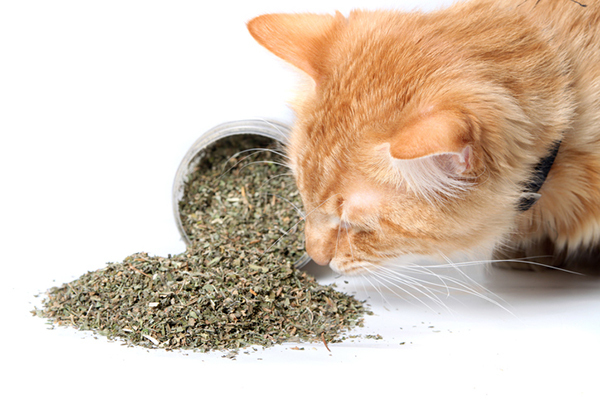 No pet owner relishes the thought of what they will do when it is a pet’s time. But in looking at the Japanese way of approaching pet death, death care, and memorial, there is a lovely simplicity to it. As in any culture, pet death care is still growing in acceptance and understanding in Japan, but the solemnity with which they approach it really tugs at my heart. To start with the passing of a pet seems to be an intensely personal time. Many pet owners, perhaps due to a Buddhist belief that animals have souls, treat their pets very similarly as they would their human children. There are two older women in my neighborhood, one with a friendly cream colored cat and one with a HUGE Shiba Inu. Both women call their pets “daughter” (the cat) and “son” (the dog). They talk to their pets with such intimacy and love, I have no doubt that they are children to them. When a pet dies, many pet parents will opt for cremation either at a shrine or cemetery facility, or at home. Yes, that’s right, at home. Unlike in the U.S. where the majority of pets are taken to a vet clinic to be euthanized — the vet having had the unenviable task of broaching euthanasia in the previous days, weeks, or months — many Japanese pets die at home. Their pain is managed by palliative and hospice care, but rarely (except in extreme cases) is a vet brought in to euthanize a pet. This is not for lack of care or sensitivity to a pet’s pain, but on the contrary, because of an owner’s devotion to a pet. Japanese people are generally very much against putting their pets to sleep. The topic itself must be avoided at all cost, so vets never ask owners if they would like to shorten the suffering of the animal by opting for euthanasia. If I were to ask, I’d be considered a monster and would lose my patients. This is because Japanese people want their pets treated exactly like humans, so they expect doctors to prolong their lives as much as possible. Of course, at the end all we can do is provide painkillers and drips and let nature take its course. It’s often a heartbreaking process, but most Japanese people feel that true love means staying by the side of their beloved pets till the very end. Muratani goes on to add that when he worked in the U.S., he viewed euthanasia as simply a different way that people loved their pet, by not letting them suffer. It’s an important reminder that though our views may be different, we all want the best for our pets. Home cremation is another option for pet parents in Japan. 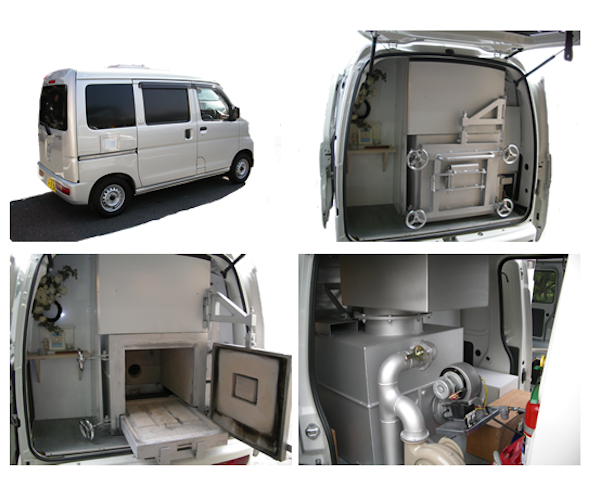 A mobile pet cremation unit such as Pet 594 Car can be called. 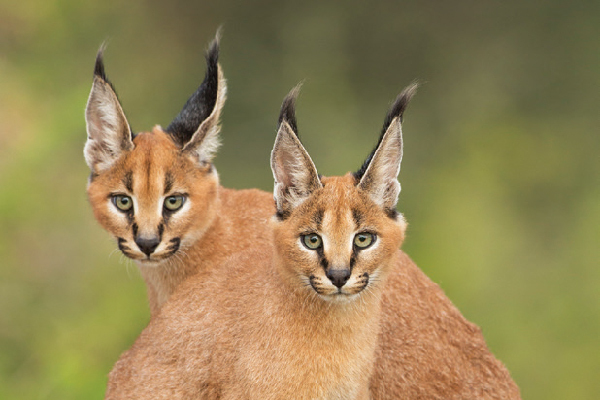 You can choose to have them come right to your residence or meet at a quiet, more private location. Upon meeting them with your pet’s body, they will cremate your pet on site. While watching your pet be put into a cremation kiln can be unsettling to western sensibilities, standing witness to the deceased body being cremated is a major part of many eastern funeral ceremonies. As a child, I remember watching my grandfather’s body be rolled into a cremation kiln. Pet 594 Car assures that the process is respectfully and tastefully done, and that the cremated remains you receive will be YOUR PET, not mixed with others. As it could take as long as two hours for the remains to incinerate, Pet 594 Car will deliver the ashes back to your home when the process is finished. If having a mobile cremation unit roll up to your home is not to your liking, pet owners also have the option to take their pet’s body to a Buddhist temple that handles pet remains. The temple will then deliver the cremated remains back to the pet parent, or some have a pet cemetery on site. 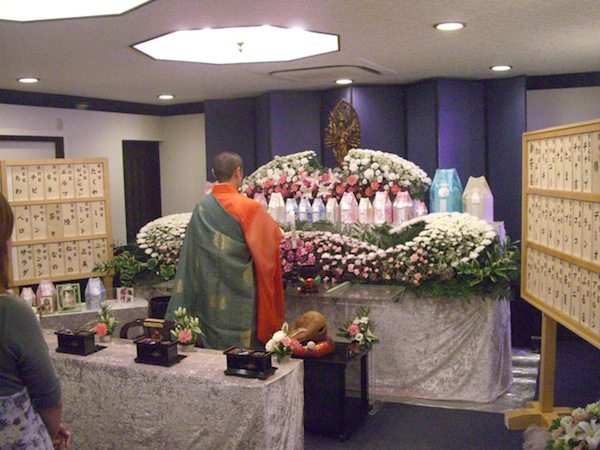 Many also offer pet funerals, where the pet’s family can assemble, light incense, offer prayer (from the family as well as from monks), and bid farewell to their beloved pet in a more ritual manner. Often the pet’s family will witness the pet’s body or coffin being moved into the kiln. Pet funerals and cremation have grown so much in the past decade that major companies such as AEON Kyushu, a large retail company, have created intermediary services for pet parents. Working with a group of pet morticians, AEON offers services in which a pet’s body will be transported to a cremation facility, and then either back to the parent’s home or to a pet cemetery or memorial site. From what I understand, AEON works with pet death-care businesses and cemeteries for pet parents, so they themselves feel cared for as well. And what about the pet cemeteries themselves? While there are many large and small throughout the country, a remarkable example is Jindaiji Pet Cemetery at Jindaiji Temple in western Tokyo. 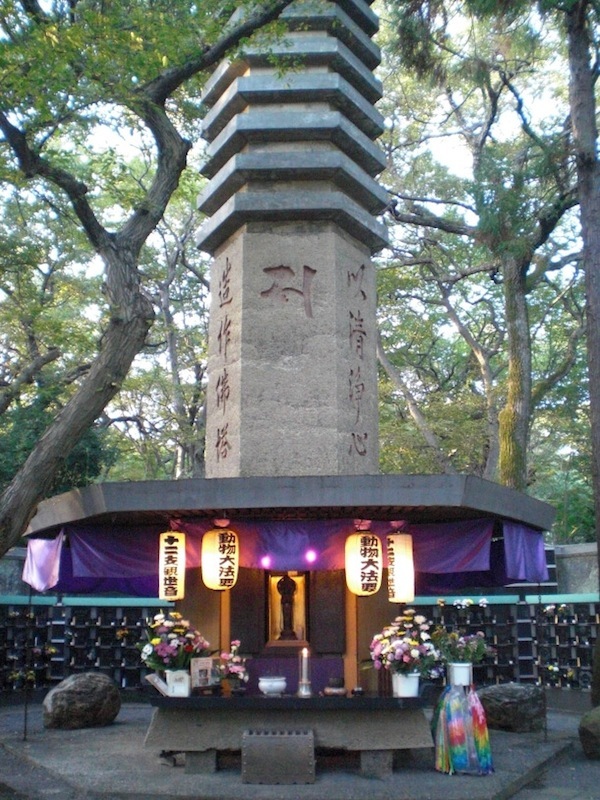 Having celebrated its 50 year anniversary in 2012, Jindaiji Pet Cemetery is one of Japan’s oldest pet cemeteries, as well as one of its most popular. Inside Jindaiji Temple is Banrei To or “Tower of Souls.” At the base of the more-than-98-foot-tall tower, Buddhist saint Junishi Kanzeou Bosatsu keeps guard over the animals. More than 20,000 pets have been laid to rest at Jindaiji Temple. Many Japanese pet parents choose pet cemeteries on temple grounds as a final resting places for their pets, in keeping with the idea that pets are a member of the family and should be honored as such in death. 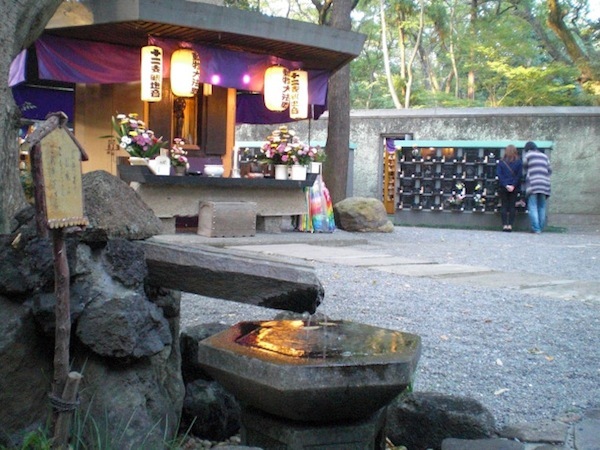 Jindaiji has both indoor and outdoor vaults where a pet’s ashes can be interred. 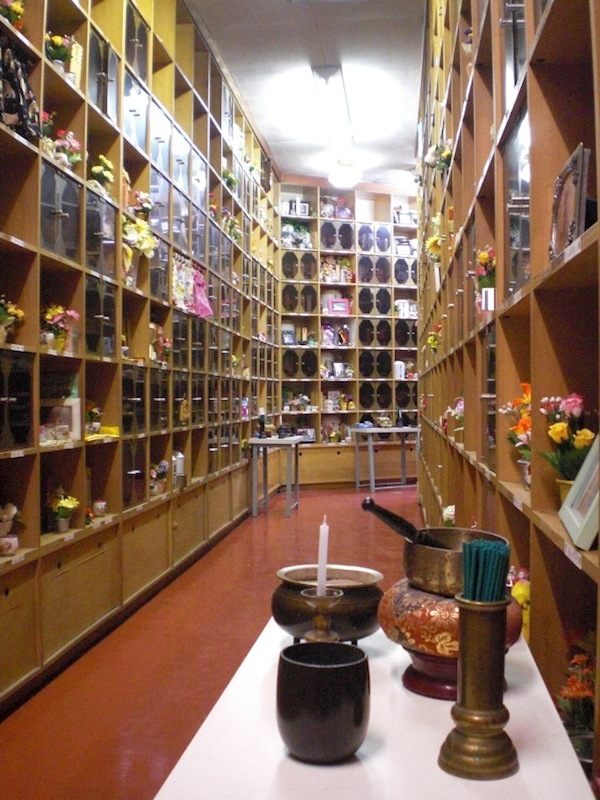 Inside, “cubbies” of various sizes can be purchased to keep an urn, Buddhist plaque, flowers, and a few tokens or offerings for a pet — food, treats, photos. The outside vaults are comprised of engraved plaques, some with personal messages and pictures. Larger gravestones or memorial monuments can also be purchased and laid on the temple grounds. As baffled and confused as I often am by life abroad, I find that one thing bridges all cultural and language gaps: the love of our animals. And while I am dazzled by a new life, a new language, and a new city, one of the best things I will take from my time in Japan is simply a reminder of how very lucky I am to have Brandy in my life. How Do You Deal With Your Cat Getting Older? 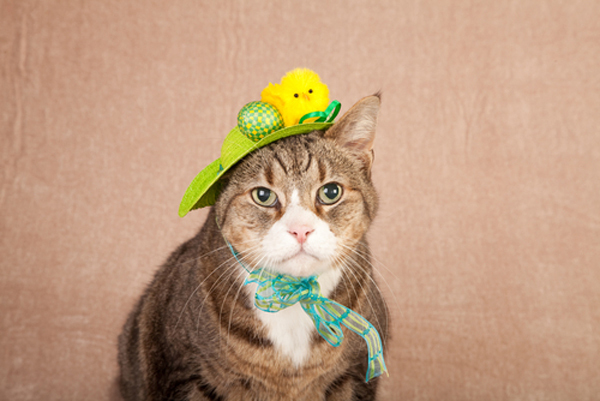 Does Your Cat Have a Secret Life? 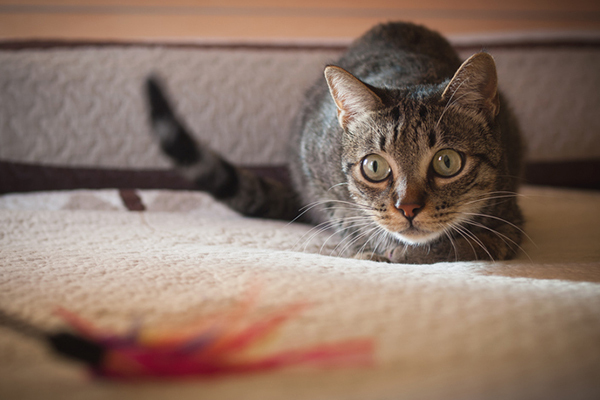 Is Your Cat Your Insomnia Buddy?